IRT East Side Line at City Hall. Photo by: John-Paul Palescandolo, March 2008. City Hall Station, situated on a loop of track in front of City Hall, was the original southern terminal of the Interborough Rapid Transit subway. The site of the 1900 groundbreaking, this station was designed to be the showpiece of the new subway. Unusually elegant in architectural style, it is unique among the original IRT stations. The platform and mezzanine feature Guastavino arches and skylights, colored glass tilework, and brass chandeliers. The curved platform is about 400' feet long, which is the length of a five car IRT train minus the front and rear doors as was the IRT's standard design for a local station when it was constructed. In the center of the platform is an archway over stairs leading to the mezzanine. On each side of the stairway, there is a glass tile "City Hall" sign, and a third is on the archway above the stairs. No other signs like these were placed in the other IRT. stations of the era; the lettering is quite unique, as is the deep blue and tan glass tiling. The arched ceiling of the platform area has simple brass light fixtures along its length. 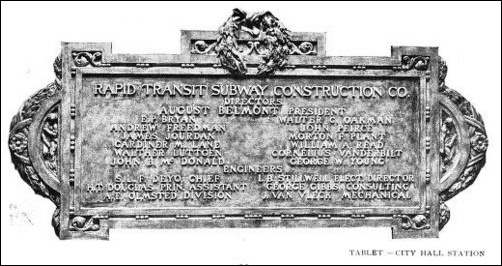 When City Hall Station opened, plaques were hung on the track-side wall commemorating the Interborough Rapid Transit company and honoring the Rapid Transit Subway Construction Co.. The plaques listed the directors, engineers, and financiers, including August Belmont, Cornelius Vanderbilt, and John D. McDonald. These plaques were removed when the station was closed, and relocated to the Brooklyn Bridge station, where they hung near a token booth until 1995. As of early 1996, the plaques are back in their original positions on the trackside wall. Contrary to popular rumor, there was no plaque here honoring Alfred Ely Beach's early pneumatic subway. The mezzanine featured a wooden ticket booth and two stairways to the street. The ticket booth is long gone. The complex green, tan, and white tiling pattern on the ceiling meets in the four corners of the vault over the mezzanine. City Hall Station opened along with the rest of the Interborough's first subway line on October 27, 1904. It was immediately clear that expansion of the subway system would be necessary and additional lines were built. But ever-increasing ridership eventually required the Interborough's five-car local stations to be lengthened to accommodate longer trains, and so the IRT underwent an extensive program of station lengthening in the 1940s and early 1950s. City Hall, due to its architecture and its being situated on a tight curve, was deemed impractical for lengthening. The new longer trains had center doors on each car, and at City Hall's tight curve, it was dangerous to open them. It was decided to abandon the station in favor of the nearby Brooklyn Bridge station, and so City Hall was closed to passenger service on December 31, 1945. The street entrances were sealed and the skylights covered over. 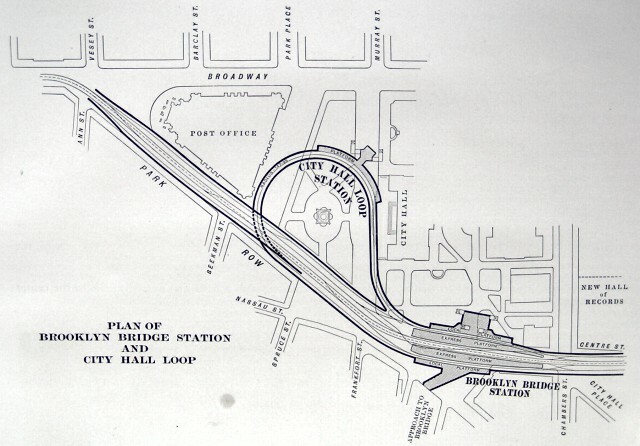 City Hall Station was never really an important one in terms of passenger use even when it was open; the nearby Brooklyn Bridge station was heavily used as it served both local and express trains, and the Brooklyn Bridge streetcar terminal was above. While the station may be closed, and very few straphangers have actually seen it, the track on which City Hall Station is located is not abandoned. The #6 trains still pass through it on their way northbound, reversing direction using the loop for the journey back to the Bronx. In fact, to get to City Hall station, one must ride on an out-of-service #6 train. To get out, the motorman would key open a a single end door to allow visitors to step carefully out onto the platform. First-time visitors are awe-struck at the station's huge glass and brick arches and tiling. From time to time the NY Transit Museum has tours of this station, but these have been suspended due to perceived security risks in the area around City Hall. Plans to open the station as an extension of the New York Transit Museum were mostly shelved due to recent security measures restricting access to the areas around City Hall. (These measures were in fact in place prior to 9/11/2001.) The station was spruced up for the October, 2004 IRT Centennial celebration. The skylights were uncovered, lighting fixed or replaced, and a stairway to the street reopened. A VIP ceremony was held there on October 27, 2004, and for a few hours after, the station was open to the public once again. It has remained closed since. Tablet, City Hall Station. 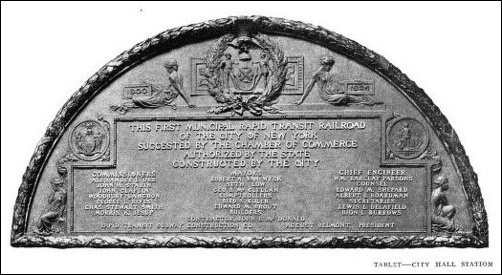 "This First Municipal Rapid Transit Railroad of the City of New York Suggested by the Chamber of Commerce, Authorized by the State, Constructed by the City." Tablet, City Hall Station. 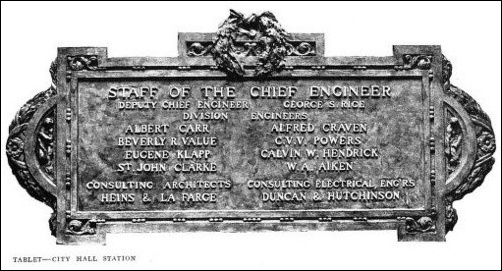 "Staff of the Chief Engineer." Tablet, City Hall Station. "Rapid Transit Subway Construction Co."
Diagram from the I.R.T. commemorative book The New York Subway: Its Construction and Equipment, shows the relative locations of Brooklyn Bridge and City Hall stations. 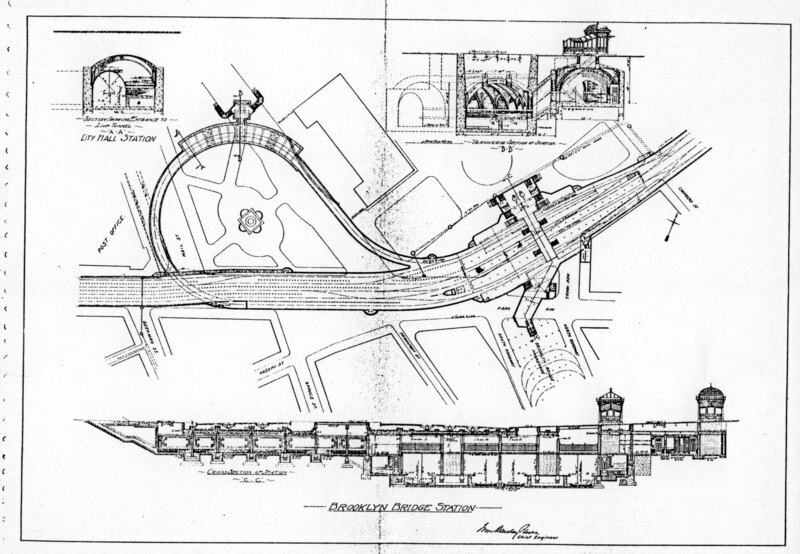 Another diagram of the Brooklyn Bridge and City Hall loop and station elevations. Photo by: Detroit Publishing Co.